Today I have a wonderful treat for all of you! I was contacted by the lovely Kendra Thorton, fellow stay at home mom and travel expert to share a yummy recipe with you all today! Valentine's Day is coming up, so if your sweetheart has a sweet tooth, this pie is sure to be an easy fix. Located in Maui, the Kapalua Resort is home to stunning bays and white beaches and is near the foot of the West Maui Mountains and a privately owned pineapple foundation. The resort offers breathtaking views and also delectable cuisine. After vacationing at the beautiful Kapalua Resort, ranked amongst top hotels in Maui, I desperately needed a way to bring the experience home to the east coast with me to share with my friends and family. One of my favorite food experiences during my stay was the tangy and not overly sweet taste of key lime pie. Since my return to the States, I've come up with my own version of the recipe that allows me to share Hawaii's local cuisine with friends and family while adding my own flair. This recipe is easy to prepare but very delicious. Mix together the sour cream and sweetened condensed milk until smooth. Stir in the key lime juice and lime zest. If you would like more lime flavor, add some additional lime juice to taste. The mixture at this point should taste tangy and full of lime flavor. 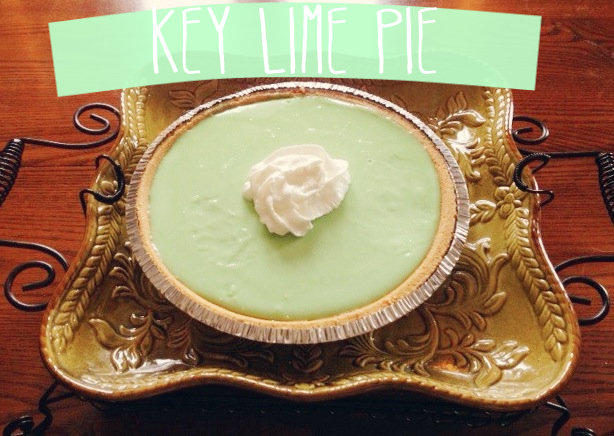 Key lime pie isn't overly sweet and that's why there is no sugar in this recipe. Next, pour the mixture into the prepared graham cracker crust. Bake in a 325 degree preheated oven for 20-25 minutes. The pie will be done when it has tiny bubbles on the surface. Do not let the pie brown or otherwise overcook the pie. Remove the pie from the oven and cool for 10-15 minutes. Refrigerate until the pie is thoroughly chilled before serving. I like to refrigerate this pie overnight so that it's set firm before serving. If you'd like, you may garnish this pie with lime slices and whipped cream. The whipped cream will add some additional sweetness that is a nice contrast to the tartness of the pie. Finally, enjoy the experience of this light and refreshing dessert with your family and friends! I hope you all enjoy, and let me know if you try this recipe out! BTW, I'm hosting a giveaway for HQCD. You could win a pair of pear drop earrings and your choice of handmade lip balm. Check it out!